For the third straight year, Tom Brady and the New England Patriots are in the Super Bowl, yet they still can't shake the stigma of cheating allegations that date back to the early years of their dynasty. From Spygate to Deflategate, the Patriots have been synonymous with shady tactics. There's cognitive dissonance out there because they continue to collect championships and the NFL honors their integrity with full faith and credit. Long and winding investigations of the team's conduct always reach a saturation point that renders the scandals boring and leaves their resolution ambiguous, at least in spirit. The apologists tend to say "everyone cheats," or else boast that the Patriots are dominantly great even if they did cheat. They didn't have to do it, so why would they risk it? Well, one Pittsburgh man who used his media position to set the record straight is now without a job. 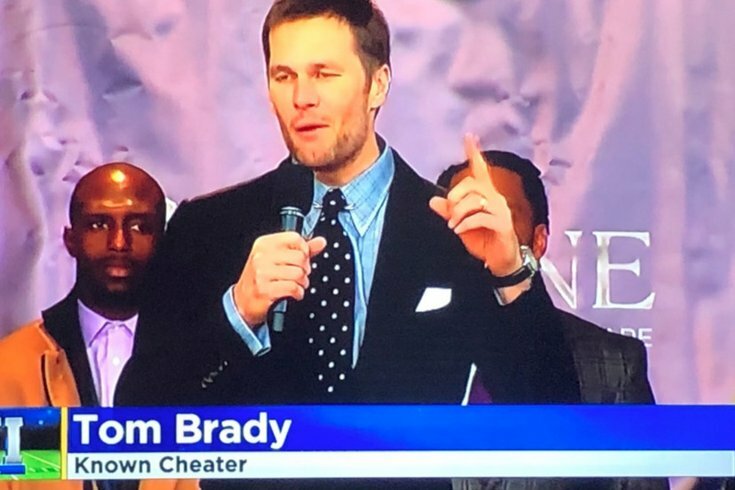 CBS affiliate KDKA fired a producer this week for flashing a graphic that read "Known Cheater" under footage of Tom Brady on Monday. The producer who lost his job identified himself on Twitter on Wednesday afternoon as Michael Talek. Sometimes it's better to laugh than cry about the mortgage payments. A friend of Talek's has launched a GoFundMe campaign to raise money for Talek as he searches for a new job. The graphic Talek briefly displayed was harmless, according to his friend. "Did this bring you joy?" the campaign asks. "Of course it did."